Die Datenbank ist auch um die neuen Proben aktualisiert. Mit dabei auch die Nivea Lip Care Dreierprobe, die hier gar nicht mit auf dem Bild ist. 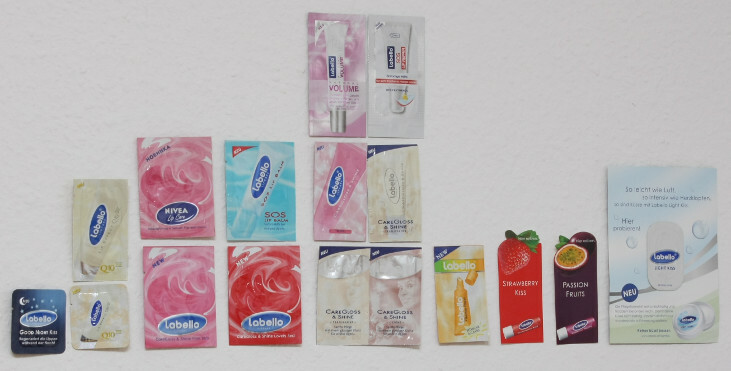 Somehow I lost sight of miy collection of Labello samples, but in the last month people asked for them from time to time. So here they are. But nearly missed the newest sample, the new Labello SOS Lip Repair, but a collector informed me about this one. There is not much more to say about the samples. Still I was not able to find one of these in a magazine, but that’s not so important. I also updated my database, including also the 3in1 sample of Nivea Care Gloss&Shine, which is not in the picture.